Nothing says “summer is here” like the smell of smoke in your hair, black charcoal smudges down your face, a bucket full of beers on ice, and an unfathomable amount of grilled meat in your belly. 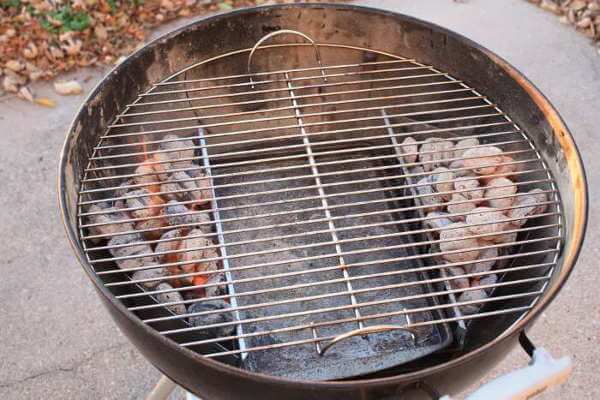 Now that all of those beautiful things are within sniffing distance, thanks to cookout season being right around the corner, we want to help you and the rest of mankind reach grilling nirvana with level-upping but dead simple barbie tricks, tips and hacks. The absolute last thing you want to do after one too many icy-cold brewskis and a belly full of sausages, burgers, steaks, chicken thighs and ribs is get to work cleaning your trusty old Weber BBQ. But really, it’s not the break-a-sweat chore it seems. It can easily be done the day after and requires tools that are already in your kitchen. Firstly, scrunch up a large ball of tin foil and scrub the warmed-up bars, before rubbing them with half a lemon or a cloth doused in cider vinegar. Use another ball of foil to bring your metal bars back to their former shiny glory. It’s that simple. Nothing kills those sweet summer vibes like weeping over unlightable coals. Even with half a bottle of lighter fluid and a whole can of Lynx soaking them, the Gods of Fire must be punishing you for something bad in your past. Forget all that with a chimney starter (£21.99). Fill its underside with paper, bang your charcoal up top, light the bottom and let the cylinder’s clever thermodynamics burn through your fuel evenly and in no time at all, ready to add to the BBQ. We’re talking zero to grillin’ in about 15 minutes. Take that, Gods of Fire! Sure, it’s a little harder to find than the black stuff you pick up from your local petrol station, but top quality, UK-grown lumpwood charcoal is the choice of the primo BBQ master. Why? Because companies like The Oxford Charcoal Company keep everything as natural as possible, shunning even the idea of adding nasty fire retardant chemicals to their gear, which will foul up the taste of your meat. Once white hot, add a handful of woodchips, like oak, hickory or apple wood (which all need to be pre-soaked for 30 mins before burning), and you’ve got the perfect clean and smoky base for your cookout. There’s a reason why everything that goes onto your grill comes off it looking blacker than your ex-girlfriend’s heart – you’re coals are a bloody mess, mate. You need to arrange your heat source so that you can cook some meats directly over the coals (direct method), and others using only the atmospheric heat under the lid (indirect method). That pic up there is a pretty decent way of looking at it, really. How to know what meats need what cooking space? Use the rule that anything ready in less than 20 mins can safely go over the coals, and anything more needs the indirect method. A real simple one this, but one we’re all guilty of. That delicious BBQ sauce you’ve just proudly slathered over your raw meat? Error. Big, fat error. There’s a whole lot of sugar in that there sauce, and sugar burns. Only add it to your meat when you’re approximately 15-20 minutes away from taking it off the heat. That way you’re stopping that sugar burning off and stinking up the flavour. Oh, and the best BBQ sauce out there? Hands down, Sweet Baby Ray’s. It’s the king. Just like those sugars in the BBQ sauce, pepper has a habit of burning when over naked flames, meaning you’re risking turning that enormous £60 rib-eye you picked up from the butchers into a big acrid-tasting disappointment. Crack your black pepper over the meat as soon as it comes off the heat instead. Dry kebabs are a huge F next to your grilling name. Is that what you want? An F? An F for FAIL? No, you do not. The simple way to avoid your meat and veg skewers from losing all their moisture is pretty straightforward, actually – make sure every ingredient is pushed up to another on the stick. Don’t be temped to cram them on though, as that’ll slow down the cooking time and risk burning. If you’re adding beef steaks to the heat and they’re not yelling in pain, you’re moving too fast. Steaks should make that sweet sizzling noise when you slap them down, so you know you’re searing in that moisture and keeping it from weeping out. You know the grill is hotter than hell and ready to go if your hand can only survive two seconds 12cm above the heat. If there is one thing your Year 8 home economics class taught you (other than pancakes don’t actually stick to the ceiling), it’s that mixing raw meat and cooked meat is bad news for everyone. Avoid that “Thanks mate, I’ve spent the day on the toilet” text the next day by investing in two pairs of tongs – one to handle the uncooked stuff, and one to handle the ready-for-the-plate stuff. Nothing kills a BBQ party like a bit of pink chicken. But the fear of undercooking your foul shouldn’t keep you from serving up this grill staple. In fact, to hell with freaking out – go ahead and cook an entire bird, and prove to your that pals that you’ve got this, you’ve totally got this. With a bit of prep before the little clucker feels the heat, you can remain confident that you’re not going to poison your pals. Spatchcocking, which is just removing the bird’s backbone and butterflying it, increases the cooking surface area, meaning more life-saving heat can get to the meat, helping it to cook through thoroughly. Check out this recipe from BBQ restaurateurs Grillstock to really nail it. Take it from us, this one really impresses your guests and almost convinces them that you know what you’re doing. Take one wooden spoon from your kitchen and lash a mixture of rosemary, thyme, sage and fresh oregano to the handle end with string. Next, melt butter in a pot and add crushed garlic. Now get the hell out there and start painting the butter garlic onto your meat with that herby flavour wand. Oh, you hear that? That’s the sound of you reaching boss-level grilling.